Since its release on April 21st, much has been written and commented about the major motion picture, The Promise. Articles describing the making of the film and its importance have been well documented and favorable, however my disappointment and reason for this open letter concerns several of your reviews on the film. Lets start with Internet Movie Database (IMDB) even though these are non-film critic reviews. I believe they set the tone for the rest of my letter. Realizing this type of forum, IMDB has increasingly become an untrusted source for real reviews due to fraudulent ratings and reviews movies printed BEFORE an actual release date. The Promise proved to be a victim of the same tactics. Internet trolls and several Turkish message boards flooded IMDB with poor reviews and 1 start ratings weeks before the film was release. This widely known issue has been covered by CBS News, The Sydney Morning Herald, and many others. “…But despite the best of intentions, the film fails to properly explain and contextualize both what led to that disgraceful episode, which Turkey to this day denies, and why it escalated as it did”. I take issue with this comment as I disagree that The Promise failed to portray the atrocities. As a matter of fact, it hits all of the points and still provides the cinematic flare of several major motion pictures depicting similar atrocities to humankind. This movie gives the viewer enough information to provide a picture of what occurred during the Genocide – without the gore and violence we are accustomed at the movies. It doesn’t need to show every gory detail of the reality our grandparents faced over a hundred years ago. If you are expecting a type of monologue at the beginning – rent a documentary about the Armenian Genocide, as there are many well produced films available. I would recommend watching The Armenian Genocide (produced by Andrew Goldberg) or Orphans of the Genocide (produced by Bared Maronian). However, The Promise was created for specific reasons and big monetary returns was not one of them. It contains an important message and anyone that saw the film understood that. Several of you have also indicated that you understand the importance of the Armenian Genocide and that it is a subject everyone should be made aware of while giving it a thumbs down of approval. This approach seems counterproductive. Do you think providing negative feedback about such an important topic sheds light on the Armenian Genocide or are you just encouraging people to stay away? 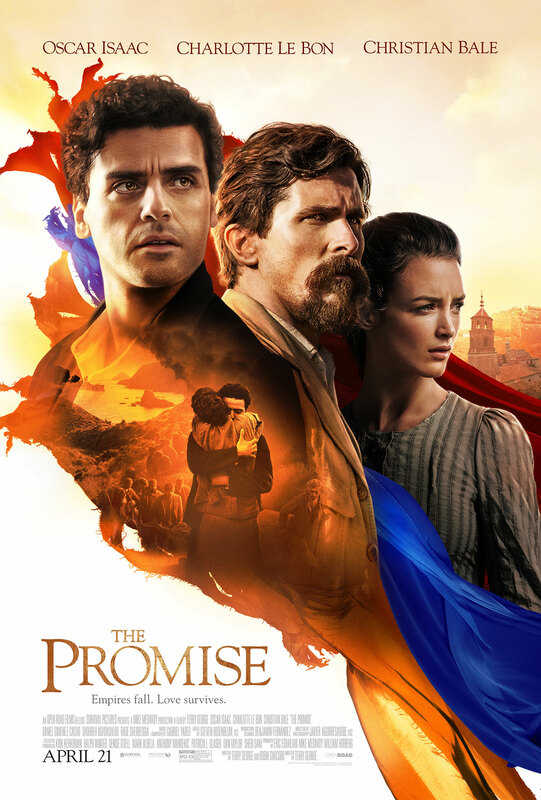 This is the first time that a major motion picture depicting the Armenian Genocide received major funding ($100 million), A-List actors, wide distribution (2000+ screens in the USA) and a massive brand awareness. But yet, your answer is to say that it wasn’t “good enough” and therefore this is supposed to encourage viewers not to watch the film. It is well documented that there were Turks that helped Armenians escape the Genocide. This was artistically portrayed in the film. Armenians fought, when they could during the massacres. Providing the retaliation at Musa Dagh was documented in a German novel called The Forty Days of Musa Dagh (1933). This battle was attempted to be made into a motion picture, but due to the pressures of the Turkish government – it was never accomplished. Talaat Pasha was portrayed as the monster that he was, the mastermind behind the plans to exterminate the Armenians. The death marches, the mass killings, the slaughter of innocent women and children. The main characters in the filmed suffered major losses, but as any Armenian has said before – we survived. Even the ending credits recaps with actual historic photos and detailed information about the Genocide. Director Terry George was purposeful when putting this film together by striking a balance between what our culture (audience) expects out of a movie and to provide historical depictions to give the viewer a chance to understand the atrocities the Armenians went through solely because of the hatred the The Ottoman Empire had for our people. I suspect that as film critics, you were expecting Shlinder’s List or perhaps Judgement in Nuremberg. In some ways, that would be great, but the big difference is that the underlined stories did not have to educate an audience. The Jewish Holocaust is widely accepted by not only the United Stated but Germany. The Armenians have not been afforded such a designation to date. How do you tell a complex story about the Armenian Genocide to the masses that sadly know little about the Armenian Genocide? The Washington Post can not even refer to the massacres as Genocide, instead says “what the film presents as the murder of 1.5 million Armenians…” I guess being that close to the nations capital has rubbed off on continuing to deny that the massacres were a Genocide. Cinemascore, an industry leader gave the film an A- compared to Beauty and the Beat which has been out in theaters for several weeks got an A. The New York Times seems to have gotten it right as well as Empire. PluggedIn understands the historical significance of such a film. RogerEbert.com said it was a great film and compared it to Dr. Zhivago. Despite your attempts to give this film a bad review, I hope the world sees past them and goes to the movie anyway. As one friend recently told me: “Whenever I read a bad review, I go out of my way more so to see the film because I know they got it wrong”. This entry was posted in armenian genocide, Journalism, Uncategorized and tagged armenian genocide, Box Office, Christian Bale, film, Kirk Kerkorian, Oscar Isaac, The Promise. Bookmark the permalink. Wow Ara, what an articulate response to those who seem to have an alternative agenda with regards to the Armenian Genocide film, The Promise. Your defense of the movie and revelation of the critics reviews made for underhanded political reasons are spot on. I feel so proud reading this high level of effective response from my people ,Armenian ( Mr. Ara Topouzian ). Any body or film critic that responds negatively ,we Armenians call them ” ANTI-ARMENIAN ” “as Anti-semite ” for example .We should fight them vigorously by educating them with more movie productions .Thank you Ara .